The Packer Ranter: No real analysis, but at least we're pretty. : Can You Hear That? As I was running with my dog this morning, I had to stop, one, because she needed to take care of some business, and, two, because I heard a sound that I had never heard before. As I stood there listening, my dog staring at me with her head cocked to the side, I could only assume this sound had slowly built to a crescendo over the past couple of weeks, and I had simply failed to notice it being preoccupied with other things. Letting the sound wash over me, I tried to find a way to characterize the sound. It was at the same time, deafening, yet soothing. Startling, yet exceedingly comforting. I raised my arms, tilted my head back and closed my eyes, simply enjoying the noise and the feeling of peace it brought me. I have no idea how long I stood there listening, but after some time, I felt a gentle tap on my shoulder. Oblivious to anything around me other than this glorious, auditory outburst I was experiencing, I had failed to realize a man and woman had been asking me for some time what I was looking at. The couple looked at each other, puzzled looks on their faces. Now it was my turn to look puzzled. The couple slowly backed away. Puzzlement had now turned to concern, for themselves or for me, I couldn’t tell. I continued my run, a wide smile on my face, the sound echoing in my ears. I began to notice that others along my route didn’t seem to share my elation much like the couple I had talked to. Was this true? Was I the only one that was able to hear it? I began to ask people I passed. “Do you hear it?” or “Can you hear that sound?” No one could, and they all seemed to shy away from me when I asked. Maybe they were scared to admit it and admit how great it made them feel. Or maybe they were just scared of me and my slightly deranged look, sporting my bedhead and covered in sweat. Regardless, not one person I passed was able to hear this sound. So, I now ask you, do you hear it? I have to know. Listen closely. Can you hear that? It’s brilliant. It’s magnificent. If you try harder, maybe you can. Just concentrate. Now? No? …seriously? You can’t hear it? 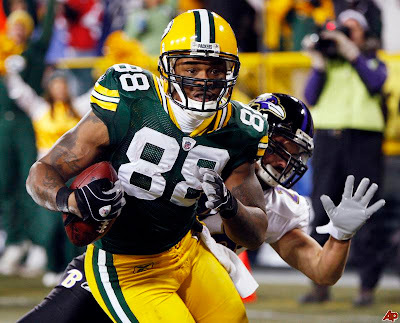 It’s the sound of not one single Packer fan complaining about Jermichael Finley. If you can’t hear it, then I feel sorry for you because it’s truly one of the best things I’ve heard (or not heard) in a long time. I will refer you back to this post when the other shoe drops. Although, he is one up on G.J. in that he doesn't ask his sister to run her mouth for him. 88's mouth works just fine. Didn't he magically button his lip until about two weeks into last season too? Fool me once and all . . .
Somebody dropped a touchdown pass last night.